Last Sunday afternoon we entered our first ever Primary School Cross Country at East Court not knowing what to expect. Having had a little walk of the course it looked like an even spread of uphill and downhill so the children were looking forward to getting their teeth stuck in! 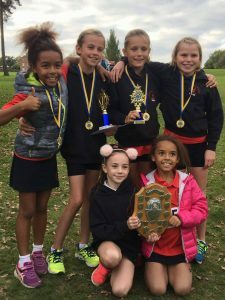 It was the girls who ran first and bearing in mind that this is a Year 6 competition we took a very young team with Tianna and Bella (Year 4), Harley, Biba and Katie (Year 5) and our solitary Year 6 team captain Gabi making up the squad. This was to be an extraordinary team run with Gabi and Katie leading the way in 1st and 2nd place but most impressively it was the cluster of Biba, Harley, Tianna and Bella in 9th, 10th, 11th and 12th. Our first 4 runners were the points scorers but the Year 4 girls can feel just as involved as their positioning meant that they forced the 4th Ardingly runner back into 13th spot. When the points were collated we were crowned the U11 Girls’ Champions. Up next was the boys team; again a very young squad took to the course with Rohan (Year 3), Alexander S (Year 4), Marcos and Luis (Year 5) and Thomas S (Year 6) hoping to repeat the Girls’ performance. Once the 2.4km race was over it was Alexander who came home first for Copthorne with a superb 8th place finish. I do not have the official finishing places for our runners yet but what I do know is that they all finished in the top 60; a fantastic achievement for a race that contained 180 boys! It was a great afternoon and something that we will continue to enter in the coming years. Thank you to the parents for giving up their Sunday to support the runners. Your cheering certainly helped us gain a few extra places! A special thank you to Sam R, who was supposed to be running but was injured at a football trial, for coming along to support his teammates.